It was beautiful and sunny this morning when we woke up. So we were able to see the gorgeous views around Lake Taupo before leaving. We went to Pak n Save (supermarket) to get food for our journey, then we set off for Tongariro National Park. Unfortunately it was raining heavy on the way and it was extremely foggy. This was such a shame as we were passing mountains that we were unable to see fully. We drove past Mt. Tongariro and Mt. Ngauruhue (Mt. Doom from Lord of the Rings). 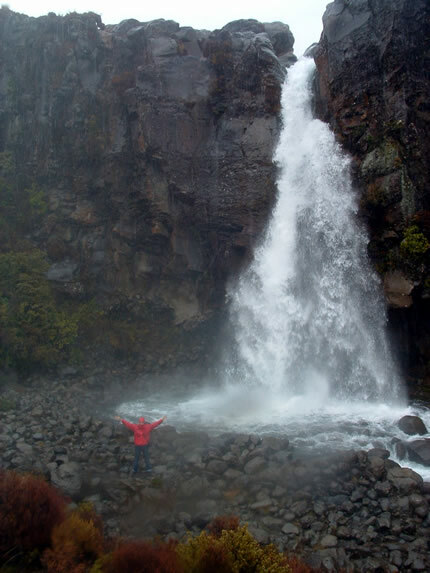 We stopped in Whakapapa village and did a 2 hour walk, taking us to Taranaki Falls. It was raining really heavy, but we decided to just keep going. Even though we got drenched, it was still well worth it. We could see remains of lava flow, from when the last eruption. When we got to the falls we walked right down to it, the spray coming off it was really powerful. If I wasn’t wet enough already, I was now! We were drenched when we got back to the van. We decided to use the rest of the afternoon, catching up with my journal and Paul had some work to do. So we stopped in Wanganui to get onto the internet. We drove onto Palmerston North tonight, and straight in our campervan there. This morning we took a look around Palmerston North. We took a look around the Plaza and also looked around the town. Then we drove on to a town called Fielding, just outside of Palmerston. 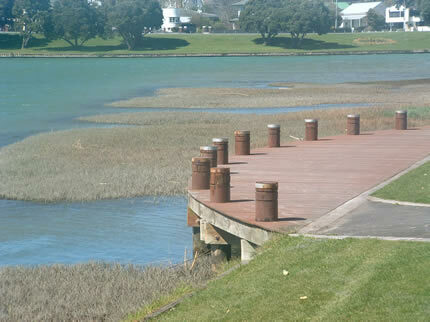 Fielding was voted best town in New Zealand for 14 years. It was a cute little town. Paul could see wind mills in the distance and wanted to know where they were, so we asked about it in the tourist information. We found out that it was the largest wind farm in the southern hemisphere. We decided to take a drive to see it. 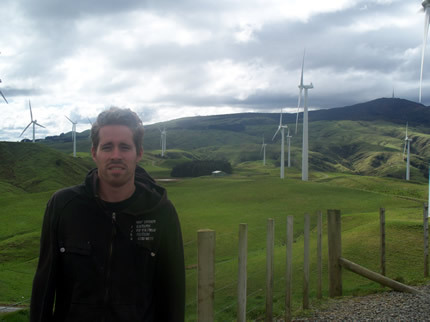 It was close to the town of Woodville and is named Te Apid Windfarm. I can understand why they have the wind farm there. It is extremely windy up on those hills. I could hardly hold myself up. We stood right under one of the wind mills. Next we stopped in the town of Woodville, for cheesecake at ‘Yummy Mummy’s cheesecake’. We got white chocolate and raspberry to share. Then we drove through Levin and stopped at Hokid, Otaki and Otaihanga beach. We drove all the way to Wellington tonight. We arrived there at about 5pm. It took us a while to find a hotel. It was a bit of a nightmare trying to park up in the city. Everywhere charges at least $4 (£2) for 1 hour. Most parking in the city is free after 6pm.We finally found a hotel to stay in. We stayed in Downtown backpackers for $80 (£40) a night. The hotel was a little out dated, but the room was fine and comfortable. A nice change from staying in the campervan anyway! We checked out of our hotel this morning at 9am. We had to find somewhere to park up for the day. We finally found a car park close to the city that cost $10 (£5) for the whole day. First of all we went to Te Papa Museum. This is one of the best museums I’ve been into for a while and it was totally free. There was so much to see and learn about and there is so many interactive activities for children and adults. There was an earth quake display, fossils, large interactive map of new Zealand, Maori Culture, kids activity room and many more. There was enough in there to spend at least 3 hours, but we only had a short time so spend in there. We went to the Botanical Gardens. There’s an old cable car that takes you up to the gardens from the city. You can get a beautiful view over the city from the gardens. Although the gardens were only small in size, compared to others we have been to, the location is still a great place for viewing the city. Next we went to Old St Paul’s. This has to be my number one spot of the day, because of the wonderful lady that we met there. Her name was Mary and she moved to New Zealand over 30 years ago with her husband. She was originally from Windsor. She showed us around the church and told us of the history there. It always helps to hear about history from someone who is passionate about what they are speaking about. I could of listened all day to Mary. 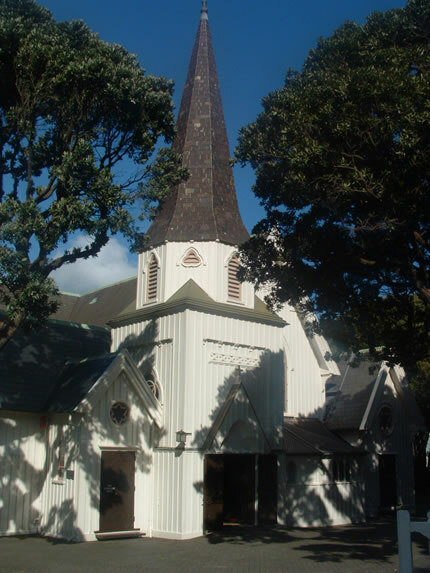 Old St. Paul’s is one of New Zealand’s greatest heritage places, and is one of the finest examples of timber Gothic Revival architecture in the world. It was the parish church of Thornton and Cathedral church of Wellington from 1866 to 1964. It is no longer a parish church, but still consecrated. It can still be used today for weddings, funerals, christenings ect. They also have concerts in there, which are open to the public. I would of loved to see a concert in there, maybe one day I will. Next we took a quick look at the parliament buildings. Unfortunately we were running short on time as we had to leave by 5:00 pm. I was going to meet up with my friend Clare tonight and her Fiancé John. Clare moved over to New Zealand over 6 years ago with her parents. I met Clare when I lived in Liverpool in 2002-2003, when studying performing arts at Liverpool Hope. We worked on our final piece together, where we had to devise a short performance. We based our performance on the story of Midsummer Nights Dream and wrote songs to go with our performance. I really enjoyed working with Clare, she was a hard worker with a lot of talent. We went to Clare’s and John’s house for dinner. It was great getting to meet up with Clare again and to meet her Fiancé John. They get married in a couple of weeks. We would of loved to be there, but unfortunately won’t be able to be there. It was great catching up and sharing stories together. 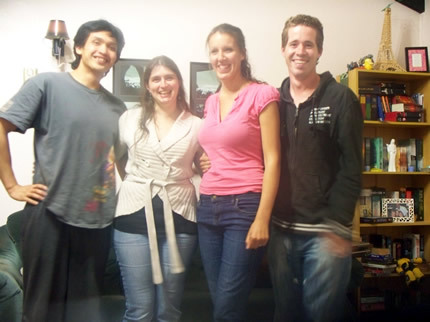 Hopefully if we ever make it back to Wellington, which I hope we do, we’ll meet up again. After spending many hours chatting with Clare and John we decided we best get on the road, as we planned on driving to Masterton tonight. This was a 1 hour journey, around mountains. I’m glad Paul was driving, as the roads were so windy and steep. We got to Masterton about midnight and straight over night in our campervan. We left Masterton early this morning and drove all the way to Gisborne. First we stopped in Hastings. This was a fairly big town. We took a look around the shopping streets and stopped for lunch. Then we drove on to Napier. Napier was a really nice town, surrounded by beautiful green top cliffs. We took a walk along the beach and also visited a cathedral that was re-built after an earthquake hit Napier in the 1930’s. We finally got to Gisborne at about 6pm. We were both really tired after all the driving, so we just took a quick walk around the city, then got to sleep in our camper. We woke up early in our camper this morning. We found shower facilities in the city, just near the McDonald’s. It cost us $3 ($1.50) each for a 10 minute shower, this included towel hire. We’ve been lucky enough to find shower facilities in most places. We planned on spending the morning in Gisborne, then moving on to our next destination. However things did not go as planned. We parked our car up and decided we would take a walk along the river. Paul saw some wooden posts right by the river and decided he wanted to jump from one to the other. He said ‘video me, video me.’ Without giving me time to even respond, he had gone ahead, as confident as ever and took a leap. What he hadn’t realised, was that what he thought was a solid river bank, was actually 2 feet of sinking mud, and yes he landed right in it! His face soon changed from confident to embarrassed, as people were walking right by. Paul soon realised that the mud was sucking his shoes in and it was difficult to get out. He had to pull his feet away from his shoes in order to get out. 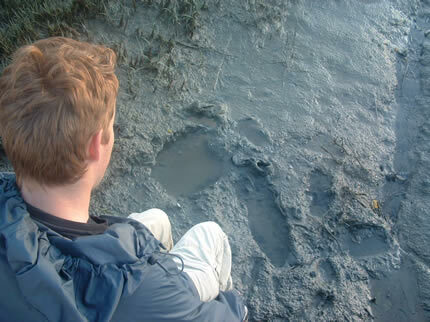 He pulled his hands and feet out of the mud and pulled himself back up on to the path, leaving his brand new trainers in the mud. He had mud all up his jeans and you couldn’t even see his hands with all the mud on them. I quickly asked him where’s your wedding ring. He realised it wasn’t on his finger, and in panic he just thought maybe he’d left it at the showers. I drove back to the showers, but it wasn’t there. He soon realised that he had put it back on and it must be in the mud. It must of slipped off his finger as he was pulling his hand back out. The ring was getting very loose on him, so this would of easily happened. He also realised that his right index finger was bleeding. I took a look and it was fairly deep, I tried taking him to the hospital, but he refused and wanted to fix it up himself. We were both really upset that the ring had gone, but didn’t know what to do, as the tide was coming back in and the mud was so sticky. We decided we wouldn’t leave without trying to get it back. So we went to the shop to buy some equipment, wellies, a basket with holes for the mud and we found two planks of wood to stand on, to stop us from falling in to the mud. We waited for the tide to go back out, which was around 5pm. We went to the Cinema in the evening to see ‘Grown ups’ with Adam Sandler in. We hoped this would take our mind off loosing the ring, but as soon as we got out we were thinking about it again. It is not so much the value of the ring in cost, but rather its sentimental value. We will be looking for a new ring for Paul soon, but it will probably have to wait till we get back. It’s funny because the day before the ring got lost we had both mentioned about getting our rings engraved and Paul said it would be a good way of someone returning it to us, if we ever lost them. We drove from Gisborne to Turanga on Saturday. We stopped in Tokomaru Bay. There was a small village near by, of which was mainly Maori people. We passed by a few other bays and beaches-Te Piu Springs, Waipro bay, Hickes Bay. Unfortunately my camera batteries fell out of my camera on one of the beaches, so I wasn’t able to get any more photos until we got new batteries. Paul decided to draw the beach that we were on instead…..I never knew Paul was an artist! Haha. It was a long drive to Turanga on the coastal road, but the scenery made it worth it. We arrived in Turanga at about 6pm. We went to the tourist information In the morning to get info on Tauranga. 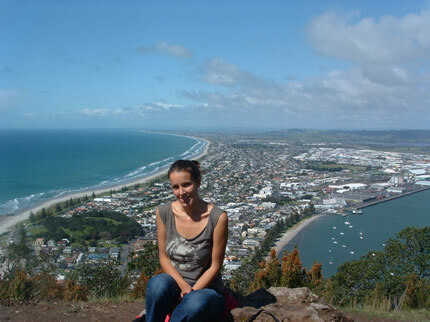 We were recommended to climb up Mount Maunganui. We drove over the bridge to Mount Manganui foothill. We took the 1hour steep climb to the top of the Mount. You get an amazing view of the bay. In the afternoon we drove on to Whangarei. The winds were really strong. There were a lot of storms around the North and South island with winds up 120 km Hr. Luckily we managed to miss most of these storms. We arrived in Whangarei at about 9pm. We slept in our campervan again. Sorry it has been so long since we have wrote anything on here. 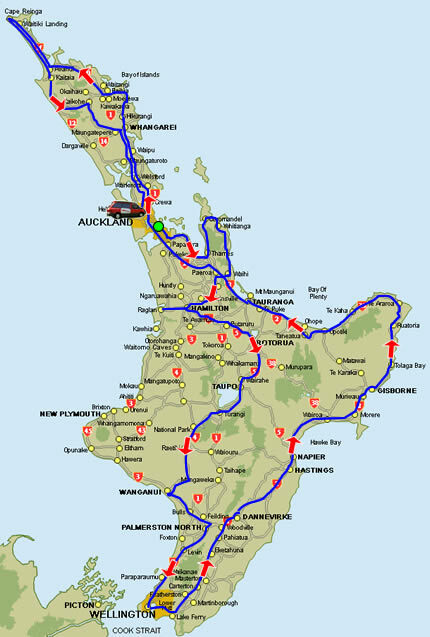 We have been driving around the North Island New Zealand for 3 weeks. We had an amazing time and we have now just arrived in Christchurch tonight. We flew from Auckland to Christchurch this evening at 16:45pm. We will be staying in Christchurch for a couple of days, then hiring out a camper again to drive around the South island. We arrived in Auckland on Thursday 2nd September, from Sydney. 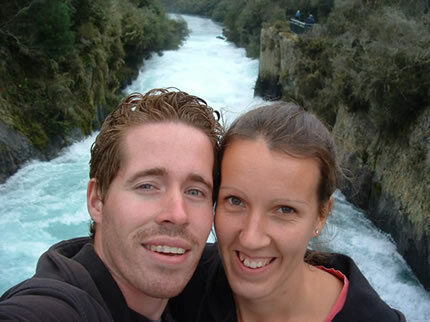 We stayed in Auckland for 4 nights, whilst we sorted out a camper for our travels around the north Island. We were excited about the opportunity to cover most of the North Island. Giving ourselves 3 weeks, would give us time to take roads that most people would have to normally cut out, because of lack of time. 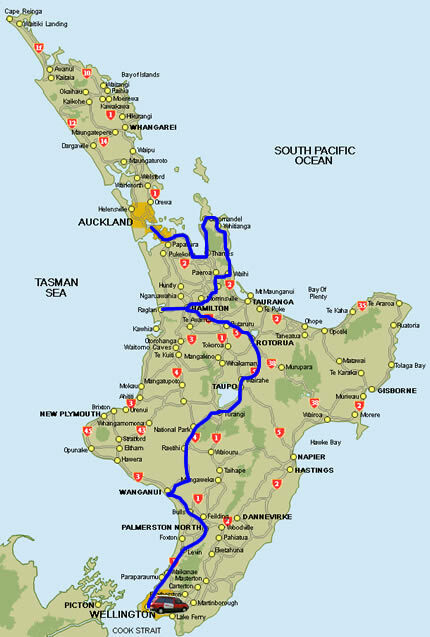 The original plan was to go to the South Island first, then finish with the North Island. However there was a 7. Earth Quake in Christchurch on Saturday 4th September, which meant made us decide otherwise. 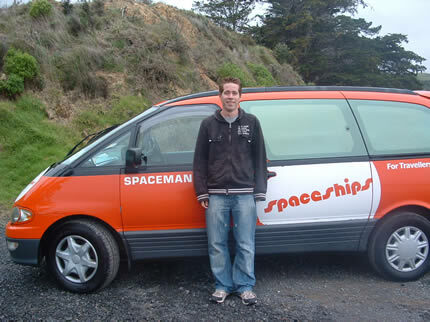 We booked our camper with Spaceships. It cost us $31 a day. It had a bed in the back, that you pull out. It also had a small cooker, pots and pans, dvd player, water supply and a small fridge. The car was automatic, which I’m not used to driving, but I was pleased to have an automatic in the end, with all the hill starts we had to do. Day 1-Monday 6th September-Auckland to Thames. We set off in our Spaceship Camper at about 4pm on Monday 6th September. We had a rough plan of our route mapped out and a rough idea of when we wanted to reach certain places by. However like all plans, they need adjusting along the way. Me and Paul are not used to driving at all. I passed my test over 8 years ago, but only had a car for a short while, and Paul passed his test nearly 2 years ago, but hasn’t had a car since. We soon got used to driving. On our first day we drove towards Thames, on the Coromandel Peninsula. We drove through the towns of Whitford and Clevedon. Our first stop was Kawakawa Bay. Then we drove by Seabird coast and Miranda. We didn’t have much daylight time as we didn’t set off till 4pm, so we stopped overnight in the camper in Thames. Day 2- Tuesday 7th September- Thames to Hamilton. We woke up early this morning, at about 5.30am. It had rained all night, the rain is so loud on the van. We set off at about 7:00am and drove to Coromandel. 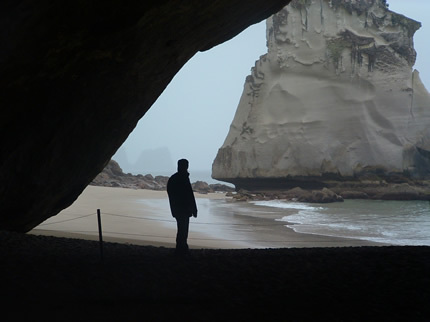 We got to Whitianga and Hahei at 9am and we were at Cathedral Cove by 10am. We parked up and walked down to Gemstone Cove. 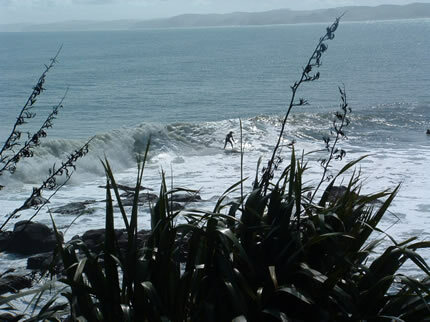 This is a popular spot for snorkelling in the summer. We were the only people on the beaches this morning, as it was wet and windy. It meant that we got the beach to ourselves, but I still think I’d prefer a beach with people on and sunshine! Maybe we’ll have to pay another visit in the summer. 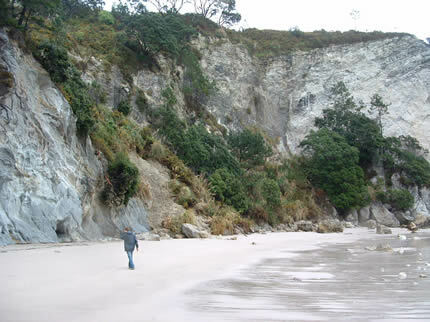 Cathedral Cove, gets its name because of the large Cove on the beach. There are also many stacks (coastal rock feature) out at sea, which make the whole view look amazing. We drove on to Hot Water beach in the afternoon. It was still raining, but we decided to still keep going, we just tried imagining everything in the sunshine. 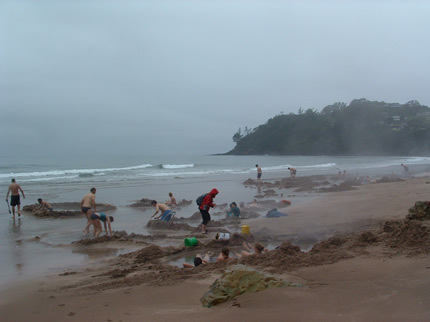 People go to hot water beach to dig in the sand and make a hot water bath. The water underneath is hot from volcanic rock under the sand. We dug a little hole in the sand to dip our feet in and it was lovely and warm. We then drove on to Whangamata, then to Waihi. 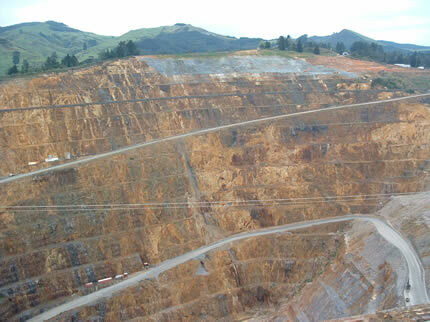 Waihi is famous for it’s gold mining and Quartz. We didn’t realise how much we stood out as tourists. When we were walking around the small town of Waihi a local man shouted from his car, Welcome to New Zealand! We can’t even blend in here in New Zealand….we’ll have to work on that. We got as far as Hamilton tonight, and slept in our camper there. We woke up early this morning and drove to the coast at Raglan. First of all we stopped at ‘Bridal Falls’ on the way. 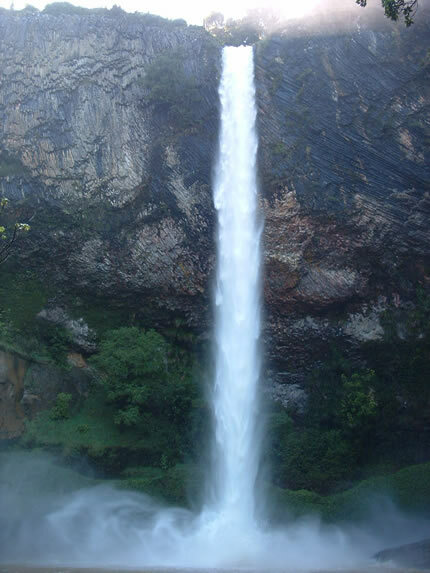 The name ‘Bridal Veil Falls’ comes from the fact that it looks like a Brides Veil. There are a few places to view the falls, we looked from the top and also walked down to view it from the bottom. We then continued driving on to Raglan. First of all we stopped in the town of Raglan and took a walk around the lake. Then we drove on to the beaches there. First of all we stopped at Whales Bay, which is famous amongst surfers, because of the waves that they get there. We stopped at a few other beaches on the drive back towards Hamilton. We checked into a hotel in Hamilton this afternoon, so that we could shower and get on to the internet. We were both feeling really tired, so it was great to get a good nights rest. We checked out of our hotel (Auto Lodge) this morning at 10am. It was great having a proper bed to sleep in. We went for a short walk around Hamilton before leaving and took a walk along the river. We went to K-Mart to buy me a new pair of jeans and new trainers for Paul. He had holes in his shoes and my trousers have been sewn back up so many times, that I was definitely due a new pair of trousers. We drove on to Cambridge from Hamilton, about a 20 minute drive away. It was a nice town with an old town hall, cathedral, park and one main shopping street. We took a quick walk around the town before driving on to Matamata. 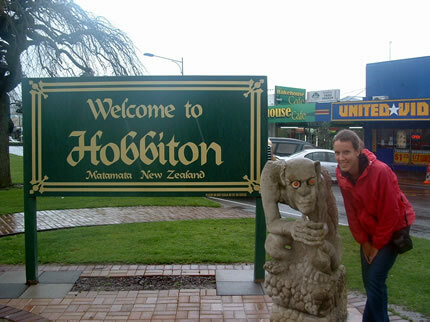 Matamata is famous for the town of Hobbiton from Lord of Rings. You can pay for a tour around the set from Lord of the Rings. This costs about $60 (£30) each. We decided not to do this, as we probably wouldn’t even recognise anything anyway. We could see a tour bus just about to drive off, so we quickly got in our camper and tried to follow them, but by the time we got round to the tour bus, they had driven off! So we decided to just drive around to see if we could see anything. Well we did see a lot of green, rolling, hills, but we didn’t really know what we were looking for, so we gave up. We met a guy the day after who had done the tour, so he filled us in. He said they only have one of the original buildings left up, but that they are re-building the Hobbiton Town for filming later this year. We got to see some pictures, so we were satisfied by that, plus it didn’t cost us anything. We drove on to Rotorua next, which was a 1 hour drive away from Matamata. 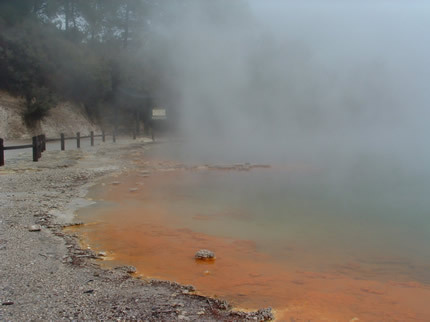 Rotorua is famous for their thermal pools and Maori culture. Over 70% of the population are Maori. 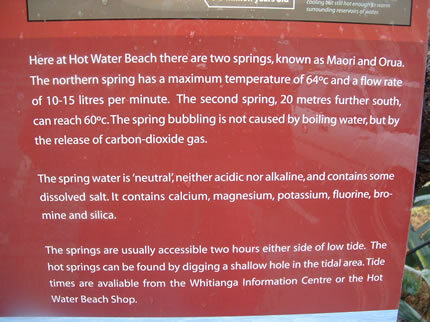 As soon as we arrived in Rotorua we noticed the smell of rotten eggs. This is caused by sulphur, because the earths crust is so thin here and causes a lot of geo-thermal activity. We didn’t arrive in Rotorua till the evening, so we just took a quick look around and decided to wait till the morning to do anything. We slept in our camper again tonight. After a few nights, we were getting used to sleeping in it. Day 5-Friday 10th September 2010-Rotorua. 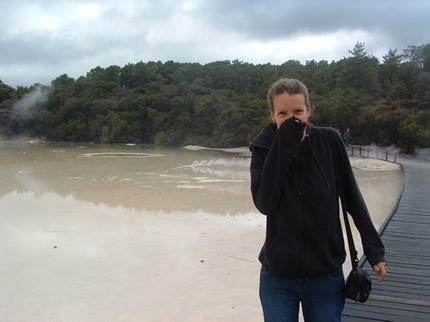 This morning we went to Wai-O-Tapu thermal wonderland, which is a geo-thermal park, 20 minutes drive from Rotorua. 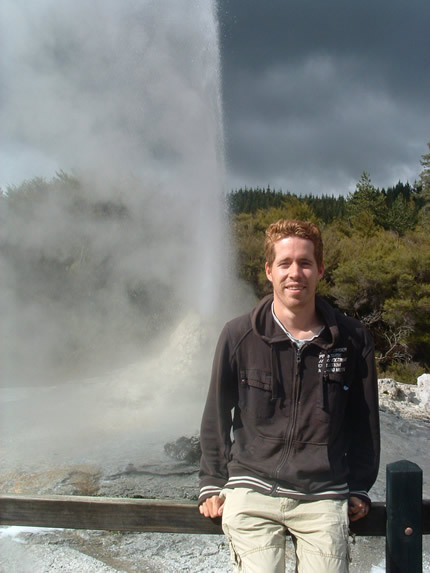 It costs $30 (£15) each to get in, which includes getting to see the Geyser going off at 10.15am. We thought there must be some trick involved in making the geyser go off, at exactly 10.15 am every morning. We found out that there was. They put a soap substance into it which makes it explode up to 15 meters high. Under the surface there are two chambers of water, one hot and one cold. The soap mixture breaks down the surface tension between the 2 chambers and allows the hot and cold water to mix. This then creates the Geyser. It was first observed by an English convict, who was washing his clothes near a stream. They dropped a bar of soap into the geyser by accident, which caused it to react and reach a height of 10-15 meters high. After discovering this, they would throw bars of soap in on a regular basis, for entertainment purposes. We saw many different volcanic features around the park. Here are a few pictures. In the afternoon we went to visit a Maori village just close by to Rotorua center. I spoke with a man in the village for a while and he shared stories and facts about his culture. 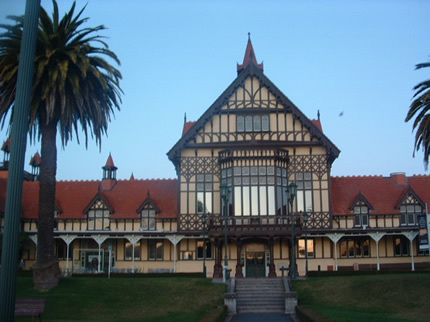 We then went to the Rotorua Museum. The entrance fee was $12 (£6) each. The museum is an old bath house, that closed down in the 60’s. People used to travel from all over the world to come to the bath house. First they would go and see the Doctor and he would prescribe a certain bath treatment for each client. The building was going to get knocked down once it was closed, but finally it was agreed to make it into a museum. 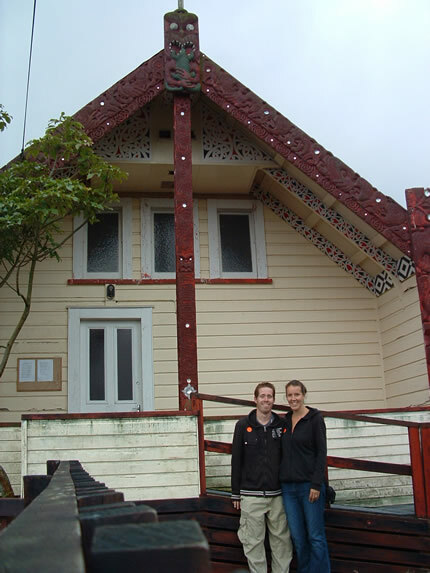 We stayed the night in Rotorua, as we still wanted to visit another Maori village in the morning. 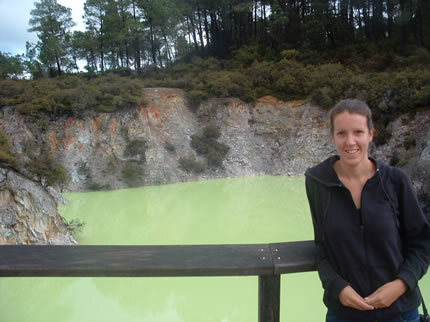 This morning we went to visit the Whakarewarewa Thermal Village-A Maori Village, just 10 minutes drive from the city. It cost us $28 each for entrance to the village for the whole day, this includes a guided tour and cultural performance. For over 300 years they have utilised the geothermal resources for daily cooking, bathing and living. They cook their meals outside in something that they call a Hangi. It’s a steam cooker, powered by the hot water under the earth. They also bath outside. We all enjoyed sitting on the warm patio by the baths whilst the guide told us stories about the village. We walked around the village our self after we went on the tour. We also watched a cultural performance given by some of the people who live in the village. Men traditionally stick their tongues out, this is a symbol of defiance, to fight away evil spirits. They also bulged their eyes out. They would do this along with chanting before war, to intimidate the other side. Well there were only 5 performers doing the dance and it intimidated me, so I think a whole army would definitely do the job! 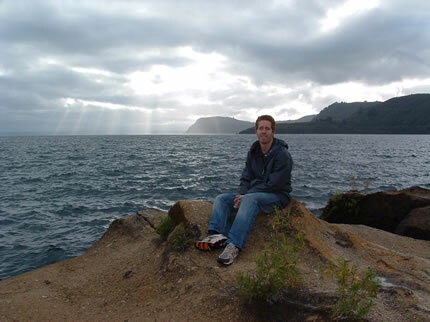 After our visit to the village we drove on to Lake Taupo. We drove down highway 5 from Rotorua, taking us about 1 hour. We stopped at a geo-thermal power station on the way and also Hukka Falls. The river at the falls was so powerful, creating a short but powerful waterfall. We got to lake Taupo at about 5.30pm. We stayed here for the night, ready to explore around the lake in the morning. This morning we went back to Hukka Falls to do a walk along the river. It was a 2 hour walk, taking us through a forest area close by to the river. We ended up by a thermal pool, where there were a group of guys bathing in it. Not a bad idea, if only we had our swimming stuff with us! We then drove on to where the dam is and at 2pm we were able to watch the dam gate being opened. This happens every day to allow water in. In the late afternoon we drove to Accicia Bay. We did a walk through a wooded area, taking us to the bay. The cliffs in the background looked amazing. We stayed the night in Taupo. We left Sydney for Auckland-New Zealand on Thursday 2nd September. We got a shuttle bus from the hotel at 7am, getting us to the airport for 8am. We flew with LAN airlines to Auckland. The flight was good, although the checking in took forever. We got to the airport 2 ½ hours before our flight and still we had to run through security to get to our gate in time for our flight. Arriving in Auckland was pretty straight forward. We got through passport control very fast, with no problems. I get 6 months in NZ and Paul gets 3 months (with his Irish Passport). I’m not sure why he gets less than I do. We got the airbus into the city from the airport. It cost us $15 each (£7) for a single into the city. The journey from the airport to the city takes about 30 minutes. We got off on Queen Street This is the main shopping St. in Auckland. Our hotel was just 5 minutes walk away on Wyndham St. We didn’t book before, but we’d looked up a few hotels before. We stayed in the All Seasons hotel. It cost $65 (£32) a night. The room comes with a small bedroom with a double bed, small kitchen area and a bathroom. We would definitely recommend the hotel. The room was small, but it had everything we needed and it was right in the centre of the city. We will write more about our time in New Zealand very soon. We are currently driving around the North Island in a camper van. We have been on the road for 10 days now. Here is a Picture of the route that we have taken so far. We are currently in Wellington. We still have another 11 days in our camper van. We will be dropping it back in Auckland, then flying to the south Island and hiring another camper there.